Ideal for everyday use or enjoying cocktails with friends, these stylish crystal RCR Mixology hi-ball tumblers are the perfect choice for any occasion. Made in Italy, they are hand crafted from high-quality dishwasher safe Luxion crystal, which adds a timeless look of elegance to create a contemporary twist on classic glassware. 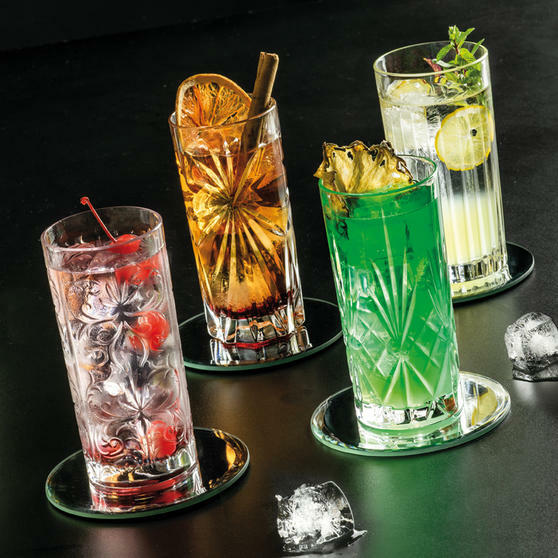 A set of four, the tumblers have complimenting styles with four different designs so that you can choose the right glass to enhance your drink and impress your guests. A set of four, these RCR Mixology glasses are the perfect companions to your favourite soft beverages or a freshly mixed cocktail. Each tumbler has a capacity of approximately 360 ml with a unique design matching the Oasis, Melodia, Tattoo and Timeless ranges.